This is the first Disney story by Don Rosa ! In it, you can find references to most of the most important stories of Carl Barks. 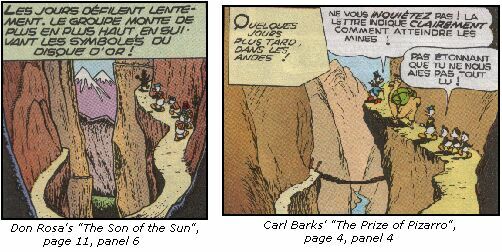 Panels from "Lost In the Andes" are also used in "Return to Plain Awful" (AR 130), and panels from "The Second-Richest Duck" are also used in "Return to Plain Awful" (AR 130), "Island At The Edge Of Time" (D 91071) (Flintheart's Money Bin), "The Last Lord Of Eldorado" (D 96066) (Flintheart's Money Bin), and "A Little Something Special" (D 96325) (Flintheart's Money Bin).